HCRA’s street party for the Queen’s 90th birthday was a huge success, bringing together scores of friends and neighbours. 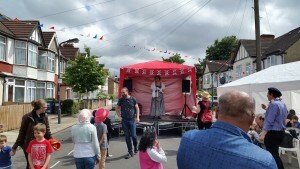 The event in Frognal Avenue on Sunday, June 12, was enjoyed by local residents young and old. The street was closed off for the celebration – thanks to Harrow Council – allowing children to play in the road and adorn the Tarmac with chalk pictures. Partygoers enjoyed a fantastic range of entertainment including live music and songs. Children took part in games and races and enjoyed face-painting and cake decorating. Residents also had the chance to be immortalised by a caricaturist. There was even the opportunity to be photographed with our very own “deputy Queen”. There was plenty of food on offer including BBQ burgers, home-made pizza, jerk chicken and other treats cooked by local people. Local shops and businesses donated some great prizes for the raffle with proceeds from this and collections on the day going towards the cost of staging the event. The celebration was also given a huge boost by generous donations from worshippers at Harrow Central Mosque. Earlier in the day as volunteers set up gazebos in the rain, organisers feared the event could be a washout. But thankfully the rain stopped and there was sunshine and blue skies for much of the afternoon. HCRA chair Brett Lake-Benson thanked everyone who played a part in planning the event, those who set up and ran activities on the day and contributed equipment, prizes and funds. “It was a fantastic day,” he said. “I want to thank everybody for all the hard work, the picking up and transporting of heavy and light stuff, the food and drink, the prep and the running of everything. Get baking for street party cake competition! Residents will be vying to create cakes fit for the Queen as part of HCRA’s street party to celebrate Her Majesty’s 90th birthday. The event on Sunday, June 12 in Frognal Avenue will feature a cake competition with a lovely prize up for grabs. Entries must be submitted by 2.30pm with judging taking place at 3pm. The street party, which will get under way at 2pm and continue to around 6pm, will also feature live music from a number of confirmed acts. There will be FREE BBQ food and a Pimms stall plus a raffle and facepainting and games for children. 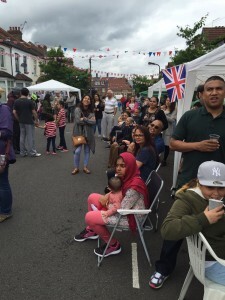 Residents will be decorating Frognal Avenue with bunting in preparation for the celebration. If you can help in any way please email chair@hcra.org.uk or call Sonia on 07516 402025.